"The sermon will be like the involuntary lip movement of one who is reading with great care, attention, and surprise." 2. Preaching should be interesting, and that, frankly, takes work (and, at the very least, a written manuscript). "We run the risk of ruining the language and letting clichés become a regular disease. The only way to avert this danger is painfully to work on every single word...in the sermon." 3. “Preaching is an attempt”…it is an act of grace to and through us…which inspires both humility and confidence. "The task is to pass on the witness to revelation that is entrusted to the church in scripture...We are not God's colleagues." Finally, there was one big theme that I just didn’t agree with. But that is part of the value of listening to temporally distant voices…it forces you to ask questions that no one is asking anymore. Even if you maintain your position, it becomes reflective rather than inherited and often ends up nuanced in important ways that it wasn’t before. 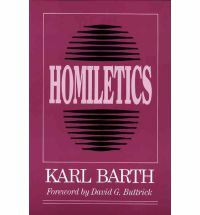 And the bottom line here is that for all of Barth’s insistence that a sermon should be interesting, he has a fundamental distrust of an introduction or application that tries to make a “point of contact” with felt needs or contemporary culture. In retrospect this isn’t surprising given his famous distrust of general revelation. Barth’s suspicion of general revelation has always been my biggest beef with his theology. I am a multi-disciplinary scientist, and therefore a general revelation guy…and also a huge proponent of illustration (my theological defense of illustration is in the first part of “session 5” here http://clpreachingclass2012.blogspot.com/). But I had never connected these things. 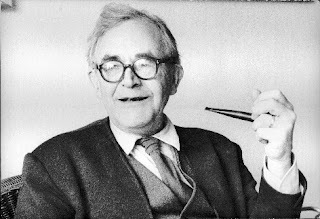 Barth’s assertion that preaching should be interesting through the shear force of carefully crafted language and careful listening to a source material that is fundamentally interesting and polyphonic was helpful. Brief history of the last 200 years of western theology (from memory, so take it for what it’s worth): Karl Barth is generally thought to be the most important theologian of the late 19th and early 20th century. He grew up and was educated in the classic Liberal theology. But the wars of the early century disabused him of the general post-millennial myth of the inevitability of human progress, and sent him back to the Christian texts. The resulting movement came to be known as neo-orthodoxy (which should not be confused with fundamentalism, a simultaneous movement in the US, which was more rigid and cantankerous because the debate in the US was more acrimonious on both sides) or even fundamentalism’s better educated, more emotionally healthy younger sibling, evangelicalism. Neo-Orthodoxy has always related to American Christianity in a strange way. It is a direct deconstruction of the Liberalism that was dominant in the main line denominations (until the atrophy, which seems to be the inevitable result of that system, made it essentially irrelevant) but it is ‘left’ of evangelicalism in important but counter-intuitive ways. But most thoughtful evangelicals go through a Barth phase (which my brother thinks is goofy, given that most of us don’t even read the important figures from our own heritage like Warfeild, Mecham, or Carl Henry - by way of illustration, I don't even know how to spell those names). But i never went through a Barth phase. Bonhoeffer was my neo-Orthodox brain crush. This is my first major interaction with primary Barth sources. It is actually more like a transcript of his class notes…but it’s still great. And, yes, I am 375 words into my footnotes and 5 words into my post. I think a lot about preaching for an engineer because I do (link) quite a bit of it and even co-teach (link) a little class on it. He argues that careful attention to the text, rather than quickly fitting the text into theological hobby horses* is the most important approach for keeping preaching interesting. He is not into ‘illustration’ and argues that the reason our preaching is boring is because we haven’t realized how interesting our text is. *But, lest this be construed as evidence of Liberal novelty hunting, he argues on the NEXT page: “All preachers need a good dogmatics…dogmatic studies…like buoys in the sea mark off the channel…protect us against running aground through ignorance or negligence.” Which is a very Augustinian idea. “We can never do enough to cultivate the organ of speech. There is a process of grinding language down which results in our repeating ourselves – using set phrases for certain things. But this leads to people missing what we are saying…repetition always robs the content of its force. Shallow reading and newspaper jargon are a danger…” Note, this is another place where I cautiously disagree. I am between Luther and Barth on this, that language should be carefully and freshly thoughtful and as sublime as possible, but also needs to be entirely accessible and surprisingly colloquial. So I’m not reproducing it in quotes…because I didn’t underline them or annotate them with my ‘hierarchy of exclamation points’ system. But rest assured, the quotes are as knowingly bombastic and delightfully cutting as those reproduced above. ‘General revelation’ is the idea that God makes himself known in part outside of the Christian scriptures (‘special revelation’), most notably through creation. 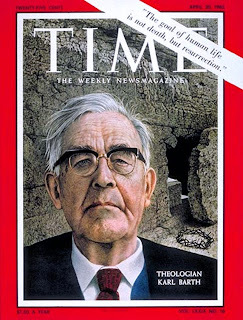 But Barth was writing against classic Liberalism that had essentially given up on the Christian texts and had gone all in on general revelation. He claims that ‘universalism’ is a misreading of his dogmatics and I’m not sure his theology of Scripture is as different from the Chicago counsel as some contend…but mostly because I just don’t know Barth. 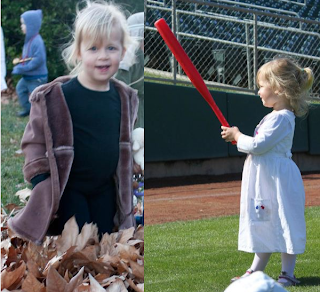 I have lots of thoughts (and a couple of posts) on this. But they are not mature yet.